Post: Gaurav Akrani. Date: 9/29/2010. No Comments. Label: Banking. 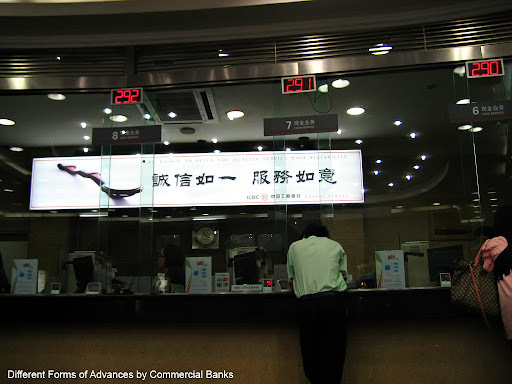 Advances by commercial banks are made in different forms such as demand loan, term loan, cash credit, overdraft etc. These forms of advances are explained below. In a demand loan account, the entire amount is paid to the debtor at one time, either in cash or by transfer to his savings bank or current account. No subsequent debit is ordinarily allowed except by way of interest, incidental charges, insurance premiums, expenses incurred for the protection of the security etc. Repayment is provided for by instalment without allowing the demand character of the loan to be affected in any way. There is usually a stipulation that in the event of any instalment, remaining unpaid, the entire amount of the loan will become due. Interest is charged on the debit balance, usually with monthly rests unless there is an arrangement to the contrary. No cheque book is issued. The security may be personal or in the form of shares, Govt. paper, fixed deposit receipt, life insurance policies, goods, etc. When a loan is granted for a fixed period exceeding three years and is repayable according to the schedule of repayment, it is known as a term loan. The period of term loan may extend up to 10 years and in some cases up to 20 years. A term loan is generally granted for fixed capital requirements, e.g. investment in plant and equipment, land and building etc. These may be required for setting up new projects or expansion or modernization of the plant and equipment. Advances granted for purchasing land / building / flat (Apartment house) are term loans. An overdraft is a fluctuating account wherein the balance sometimes may be in credit and at other times in debit. Overdraft facilities are allowed in current accounts only. Opening of an overdraft account requires that a current account will have to be formally opened, and the usual account opening form completed. Whereas in a current account cheques are honoured if the balance is in credit, the overdraft arrangement enables a customer to draw over and above his own balance up to the extent of the limit stipulated. For example, if there is a credit balance of Rs.40,000/- (approx. $890 USD) in a customer's current account and an overdraft limit of Rs. 50,000/- (approx. $1,113 USD) is sanctioned to the party, he can draw cheques up to Rs. 90,000/- (approx. $2,003 USD). There is no restriction, unlike in the case of loans, on drawing more than once. In fact, as many drawings and repayments are permitted as the customer would desire, provided the total amount overdrawn, i.e. the debit balance at any time does not exceed the agreed limit. This is a satisfactory arrangement from the customer's point of view. He need not hesitate to pay into the account any moneys for fear that an amount once paid in cannot be drawn out or borrowed again, unlike in a loan account. As in the case of a demand loan account, the security in an overdraft account may be either personal or tangible. The tangible security may be in the form of shares, government paper, life insurance policies, fixed deposit receipts etc. i.e. paper securities. A cheque book is issued in an overdraft account. A cash credit is essentially a drawing account against credit granted by the bank and is operated in the same way as a current account in which an overdraft limit has been sanctioned. The principal advantages of a cash credit account to a borrower are that, unlike the party borrowing on a fixed loan basis, he may operate the account within the stipulated limit as and when required and can save interest by reducing the debit balance whenever he is in a position to do so. The borrower can also provide alternative securities from time to time in conformity with the terms of the advance and according to his own requirements. Cash credits are normally granted against the security of goods e.g. raw materials, stock in process, finished goods. It is also granted against the security of book-debts. If there is good turnover both in the account and in the goods, and there are no adverse factors, a cash credit limit is allowed to continue for years together. Of course a periodical review would be necessary. Bills, clean or documentary, are sometimes purchased from approved customers in whose favour regular limits are sanctioned. In the case of documentary bills, the drafts are accompanied by documents of title to goods such as railway receipts or bills of lading (BOL). Before granting a limit, the creditworthiness of the drawer is to be ascertained. Sometimes the financial standing of the drawees of the bills are verified, particularly when the bills are drawn from time to time on the same drawees and/or the amounts are large. Although the term "Bills Purchased" seems to imply that the bank becomes the purchaser / owner of such bills, it will be observed that in almost all cases, the bank holds the bills (even if they are indorsed in its favour) only as security for the advance. In addition to any rights the banker may have against the parties liable on the hills, he can also fully exercise a pledgee's right over the goods covered by the documents. Usance bills, maturing within 90 days or so after date or sight, are discounted by banks for approved parties. In case a bill, say for Rs. 10,000/- (approx. $223 USD) due 90 days hence, is discounted today at 20% per annum, the borrower is paid Rs. 9,500/- (approx. $211 USD), its present worth. However the full amount is collected from the drawee on maturity. The difference between the present worth and the amount of the bill represents earning of the banker for the period for which the bill is to run. In banking terminology this item of income is called "discount".